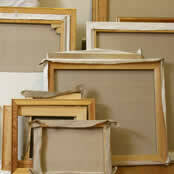 In the art world, the term canvas refers to any prepared material stretched on a frame for painting. Invented in the early 16th century by Italian painters who wanted a rigid foundation that would be lighter than the wooden panels they were used to painting on, stretched canvas has become the most widely used support in the world for painting. Despite its worldwide popularity and prevalence across all artistic media, however, purchasing and working with canvas continues to be a source of frustration for many artists. Often artists make their own custom canvases by measuring, cutting, and stretching the fabric over a frame by hand. It's a process compounded by the fact that rolls of canvas are tough to find in many areas. Luckily, MisterArt.com is committed to making canvas affordable and easy to get on any budget! We have rock-bottom prices on a large selection of both rolled and pre-stretched canvases, and we ship all over the U.S.! Because we strive to make purchasing canvas online the best experience possible, we've designed this guide to help artists familiarize themselves with the many different kinds of canvas available at MisterArt.com. We're confident it will help you find the perfect canvas for your next project! Canvas began to outdistance wood panels as the preferred medium for painters in Northern Europe around the 17th century. During the Renaissance period, painters often layered many coats of white lead paint on to their canvases and polished the surface until it was as smooth as possible. This was done to prevent the texture of the canvas from appearing visible in the finished artwork. Today, artists typically take advantage of canvas' texture in their work. Linen, woven of flax fiber, generally provides the highest quality of canvas. Linen is very durable, resists expansion and contraction due to moisture, and stays supple longer than most other fabrics. It possesses a fine, even grain, but with a slightly irregular appearance that can remain apparent through multiple layers of paint, providing character to the painting's surface. Linen canvas is available in a variety of weights and weaves, ranging from heavy and rough to light and smooth. Linen canvas is, however, expensive to produce and to purchase, which makes it less than ideal for the beginner or the artist on a budget. Cheap linens are available, but they may be loosely woven and prone to warping. Cotton canvas is the usual alternative to linen, especially when cost is the primary deciding factor. The heavier cotton ducks are often used to make student-quality canvas and they do provide an acceptable support for painting. Most cotton canvases, however, expand and contract in response to moisture and are prone to sagging and other distortions in damp weather. Cotton canvases also possess a much more regular weave than linen, which can become obscured by layers of paint and leave painting surfaces looking flat. Synthetic canvas is a more recent invention, developed in the 20th century. It's usually spun from woven polyester fiber, so it retains a similar look and feel to natural canvases. Synthetic canvas is of a lighter weight, stretches nicely, and resists warping, bacteria, and mold. It's also inexpensive when compared to cotton and linen canvas. The primary disadvantage of synthetic canvas is that it is usually highly uniform in texture so it doesn't provide the same character to painting surfaces as natural canvas. The cheapest choice for canvas material is jute, also called Hessian cloth or burlap. Jute is extremely inexpensive, but it brittles and weakens with age so it is not generally suitable for permanent works. It has a very coarse weave with a pronounced texture. Because they are so cheap, jute canvases are often used for preliminary sketching. Canvas boards are pre-made supports in which canvas has been glued or pasted to a board backing, usually cardboard or pasteboard. They provide a convenient and light support that's great for beginners, students, and others interested in producing artwork on the cheap. While there are some very affordably constructed canvas boards on the market prone to warp and deteriorate over time, many professional grade boards are also available. These archival-quality canvas boards provide a support as permanent and durable as other, more traditional types of canvas. Canvas boards are also prized for their portability, but unlike rolled canvas, they only come in pre-determined sizes. Different styles of painting call for different kinds of canvas board, of course. Canvas boards pre-treated with gesso save oil and acrylic painters the time it takes to prime their supports. Canvas boards devised with clay textures or special primers are also available for watercolor artists. You can find the best deals on all of these canvas boards and more every day at MisterArt.com! Canvas paper and pads are an economical alternative to canvas. While canvas is a pricey material that can be a hassle to transport, prime, and stretch, canvas paper and pads can be taken anywhere and used with any artistic medium without the need for stretching or priming-- and they're affordable on any budget! These qualities make canvas paper and canvas pads a favorite amongst students and artists who want to practice their painting skills on canvas without shelling out big bucks for their sketches and experiments. Although most canvas paper and pads can be trimmed and cut down to size, they typically aren't available in very large sizes. Mostly, they're used for quick studies. Canvas paper and pads are made from a variety of materials. Some are simply heavyweight papers that simulate the rough tooth and surface texture of canvas. Other pads are available featuring genuine linen and cotton canvases, made acid-free and suitable for mounting and framing. Other canvas papers are designed for specific uses. Inkjet canvas is paper designed to be used in your computer's printer, allowing artists to transfer digital work directly on to canvas. Canvas cards and envelopes allow painters and crafters to send real works of art through the mail! No matter the reason or medium inspiring you to give canvas paper and pads a try, however, you're sure to find deep discounts on what you need at MisterArt.com! Priming and sizing are techniques used to prepare a canvas before paining to ensure its lasting durability. Stretched canvases are often coated with a substance known as gesso to prevent oil paint from coming into direct contact with the canvas fibers, which can eventually cause the canvas to decay. Historically, artists used a chalk gesso composed of lead carbonate and linseed oil, applied over a rabbit skin glue ground. A variation of this formula, using titanium white pigment and calcium carbonate, proved to grow brittle and become susceptible to cracking. Modern, more-flexible canvas primers are available today. These acrylic gessoes work great on a variety of absorbent surfaces where acrylic colors, polymers, oil colors, tempera, or casein will be applied. MisterArt.com stocks acrylic gesso in many different colors in order to accommodate any project! Sizes also reduce canvas' absorbency. The purpose of the sizing is to seal the fibers of the canvas, not to provide a continuous, solid paint film. If too much glue is applied, cracking will result. The traditional method of sizing a canvas for oil paintings involves the use of a hide glue, such as rabbit-skin glue. You can find everyday discounts on all the materials you need to prime or size canvas at MisterArt.com! Rolled canvas is the most versatile form of canvas available. By cutting rolled canvas and applying it to their own stretchers, artists can make custom supports of any size and shape imaginable. If your project requires a very large or very small canvas, purchasing a roll is likely the best option. Rolled canvas isn't as convenient as other canvases, however. It requires a good bit of time, patience, and skill to measure, cut, stretch, and prime rolled canvas so that it is ready to be painted. Because canvas is such a versatile medium, MisterArt.com has deals on a wide variety of rolled canvases intended for many different uses. Oil painters may prefer primed linen canvas in order to achieve professional results without a lot of prep work. Unprimed linen and cotton duck rolled canvas are the most versatile styles—with the proper priming, sizing, and stretching, these canvases can be used for nearly any style of painting or crafting. Primed synthetic and cotton rolls are an ideal choice for artists on a budget to make their own supports. No matter what style of canvas fits your budget and ambitions, you'll find it at MisterArt.com! Stretched canvas is a great alternative to rolled canvas for artists who want the same quality of support for their work but can't or would rather not spend the time and effort necessary to stretch a canvas themselves. There are other advantages to stretched canvases, too—because they're stretched by machines, they tend to come out more uniform and consistent than hand-stretched canvases. They also come in different shapes that are more difficult to stretch by hand, such as hexagons, circles, ovals, and triangles. As with other kinds of canvas available online, stretched canvases are manufactured in a wide array of styles to ensure that there is a stretched canvas to fit any budget or project! Although only rolled canvas can be adapted to any size, stretched canvas is available in many different sizes to choose from. Stretched canvas ranges in quality from ultrasmooth portrait-grade supports to economy grade for students and beginners. Gallery-style canvases are available for artists who wish to paint the edges of their supports. Stretched canvases have even been designed to fit flush inside corners! You can find them all and more at MisterArt.com! Many artists enjoy the freedom to tinker with their own canvases! By stretching their own canvas, artists can customize the size, shape, and depth of their supports. A few tools and supplies are needed, however, that can often be tricky to find at a local art shop. Fortunately, you can find great deals on stretching supplies every day at MisterArt.com! Stretcher strips are wooden or aluminum bars that join at the end to form frames over which canvas is stretched. Stretcher bars are available in many sizes and styles, from lightweight to heavy duty. Canvas tacks and staples are used to attach the stretched canvas to its stretcher-strip frame. Staples are typically easier to apply, but copper tacks will age but not rust like steel staples. Canvas pliers are used to stretch a canvas and hold it taught while it's being attached to stretcher bars with staples or tacks. Frame clips use spring power to wedge stretched canvases into frames. Using frame clips, artists can quickly and easily swap out different canvases with the same frames! As always, MisterArt.com guarantees the lowest prices on art and craft supplies you'll find on the Internet! If we don't already offer the lowest price, we'll gladly match it! Linen, woven of flax fiber, generally provides the highest quality of canvas. Linen is very durable, resists expansion and contraction due to moisture, and stays supple longer than most other fabrics. It possesses a fine, even grain, but with a slightly irregular appearance that can remain apparent through multiple layers of paint, providing character to the painting's surface. Linen canvas is available in a variety of weights and weaves, ranging from heavy and rough to light and smooth. Linen canvas is, however, expensive to produce and to purchase, which makes it less than ideal for the beginner or the artist on a budget. Cheap linens are available, but they may be loosely woven and prone to warping.